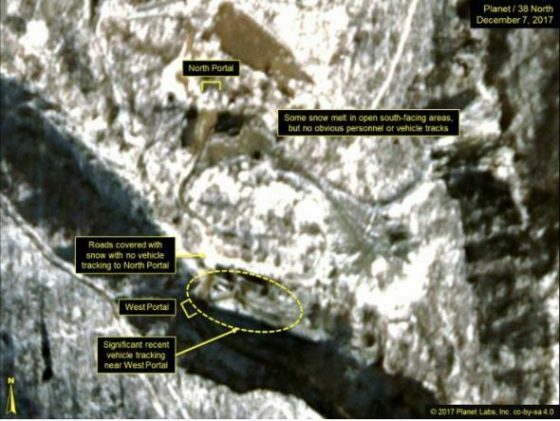 Chilling satellite images are showing fresh new activity at North Korea’s nuclear test facility. The activity is likely to further increase tensions with Washington and spark fears of an inevitable third world war. Watchdog 38 North reports that there has been a “consistently high” level of activity at the West portal of the Punggye-ri Nuclear Test Site. The images show nothing new has been added to the site, but the presence and movement of the equipment at the site has significantly increased. Mining carts, vehicles, and personnel have been seen at the site suggesting a tunnel excavation is underway, as Pyongyang readies the tunnel for further nuclear testing. So far, the West Portal tunnel complex has not been used. Five of the past six nuclear tests were conducted at the North Portal, but no vehicles or equipment have been seen there since September. Some are guessing that the recent tremors near the site have damaged the nuclear test facility, but satellite imagery cannot confirm this. It wouldn’t be the first time that North Korea inflicted damage upon itself either. The images have surfaced at the same time as CNN reported on the rogue regime’s development of bioweapons. Kim Jong-un could be developing bioweapons amid escalating tensions on the Korean peninsula, sparking more fears that he’s shifting gears, and plowing into an even more disturbing territory. Kim is said to have sent experts around the world to get degrees in microbiology and is making moves that suggest he will build more factories and laboratories to manufacture biological weaponry. The leader of the hermit nation has also steadily been acquiring new machinery that could be used to churn out deadly microbes, some United States and Asian intelligence officials have claimed. US analysts are concerned that the research could mean the regime is producing dangerous microbes and pathogens that could be loaded into bioweapons. A US official told the Washington Post that it is known that the North Koreans have biological agents by various means. North Korea has been quieter about their biological weapons advancements than they have been about their desire to acquire nuclear weapons.